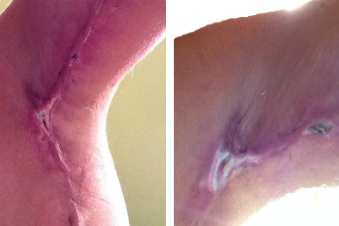 Skin dehiscence in the left axilla (wound rupture in the arm pit) at 2- and 3-weeks post brachioplasty. 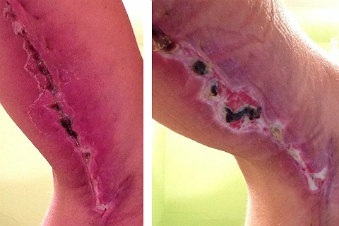 Skin dehiscence in the right axilla and skin necrosis (death) along the right arm incision at 2- and 3-weeks post brachioplasty. In the first photo, we see where my surgeon marked up my arm pre-operatively to commit to where he would excise the excess skin and fat during my brachioplasty, or arm lift plastic surgery. The remaining photos show arm lift complications that began in the second week post-operatively. I assure you that these are minor complications and are not as awful as they look. Both right and left arms have small skin dehiscence - or wound ruptures - in the arm pit area, known as the axilla. This will occur in about 25% of cases according to my plastic surgeon, so I was not at all surprised when it happened to me. However, as misfortune would have it, these complications set in on the very day that I left my surgeon's care for my flight back home. If you have been following my body contouring journey following massive weight loss, then you no doubt recall that my plastic surgeon is roughly 700-miles away out-of-state. I would much rather have had this happen when I could be treated in my plastic surgeon's office. But the reality is that although my wounds look bad, they are relatively easy to treat. My surgeon told me to keep them dry with gauze and they should stabilize in size within the week, at 3-weeks post-surgery. He said they should then heal in 3-weeks. So I should be fine at 6-weeks post op, which is when I can resume vigorous exercise. Additionally the photos show some minor skin necrosis (death of skin cells) and redness in the right arm along the incision line about 4-5 inches down the arm, and includes the circular wound with healthy red flesh beneath. This is not a true necrosis because the underlying skin is in good condition and only a small area of superficial skin cells are sloughing off. View images of skin necrosis and you will see the difference. My surgeon had me get a Complete Blood Count lab test to check my white blood cells. He reported back to me that my white blood cell count was normal and that a high white blood cell count would have been suggestive of an infection. So, he told me tension often creates redness and the skin cells sloughing off was owing to how tight he pulled the skin. Despite this minor setback in healing and the discomfort of the wounds, I am glad that he pulled my arms very tight. The trade-off is worth it to me. My perspective is that if I am going to have a scar from arm pit to elbow, then I want the result to be the very best shaped arms I can get. Too many surgeons under-correct the arm and the end result is mediocre and can require a second surgery to excise the flesh. My surgeon is highly experienced in this procedure, with the largest published series in the world of arm lifts on the massive weight loss patient. So I am very confident in his surgical skills and management of complications. It is critical to your safety and outcomes that you choose the right surgeon for body contouring after weight loss based on his/her surgical experience and expertise. Sometimes these things just happen after surgery. Setbacks can happen even with the most amazingly-skilled surgeon and the most-compliant patient.